With the Iran nuclear deal now in force, the United States can devote its energies to its next big regional challenge: dealing a crippling blow to Islamic State. The geopolitical strategy to move toward this goal is more circuitous than one might think, contends Stratfor, the global intelligence company. The discussion begins and ends with Turkey. The United States is already working with predominantly Kurdish rebel factions east of the Euphrates River in northern Syria and with Iraqi forces along the Iraq-Syria border to try to strangle the Islamic State in Raqqa. But the United States needs a lot of assistance from Turkey west of the Euphrates to tie the noose. Turkey is prepared to commit ground troops to an operation in northern Syria – especially after last week’s suicide bombing. The chief complication is Russia. Following the November downing of a Russian warplane by Turkish forces, Russia’s air defence buildup in Syria, paired with a direct threat to shoot down any aerial targets that could threaten Russian aircraft in Syria, has complicated Turkey’s military planning. The United States, which has established rules of engagement with Russia for the Syrian battlefield, has taken it upon itself to try to work out a similar understanding between Turkey and Russia to get the battle plans in motion again. US Secretary of State John Kerry was deployed to Moscow in mid-December to attempt to facilitate a dialogue between Turkey and Russia. Kerry will meet again with Russian Foreign Minister Sergei Lavrov on 20 January in Zurich, where the topic will probably come up again. 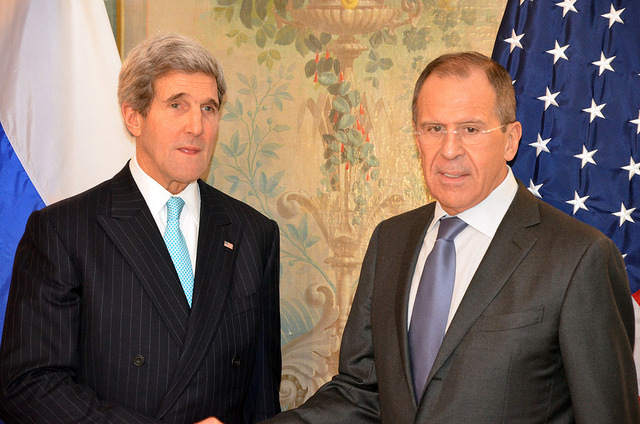 Kerry and Lavrov’s agenda will probably also include trying to resolve the current impasse in the Minsk talks and trying to come up with a common list of participants for the next Syrian negotiation slated for 25 January. On the Syria matter, Turkey plays a crucial role in bringing the rebel factions it sponsors to the table (while trying to keep Kurdish factions out of the negotiation altogether), and Turkey and Russia’s frosty relationship only adds to the complications afflicting the Syrian negotiation. On the Ukraine issue, the United States seems to be signaling that sanctions relief for Russia is on the table should Russia take substantial steps to implement the Minsk agreement. (Notably, as US State Department Coordinator for Sanctions Policy Daniel Fried emphasised Monday, the United States and Europe kept the sanctions related to Russia’s occupation of Crimea separate from the sanctions related to the Donbas conflict, presumably giving Washington some flexibility if Moscow delivers on Minsk.) But we are not expecting much progress on the Minsk front. Russia has demonstrated its ability to control events on the ground in eastern Ukraine, but Moscow would require concrete political concessions from Kyiv – concessions that the US-backed and politically fragile Ukrainian government is not prepared to make – before it considers withdrawing its forces and defusing the violence. But there might be something else that Washington could use to get Moscow’s attention. Victoria Nuland, the U.S. assistant secretary of state for European and Eurasian affairs, had a four-hour meeting with Russian presidential aide Vladislav Surkov in Kaliningrad on 15 January. The meeting was added onto a regional tour Nuland has been taking through Lithuania, Romania, Bulgaria and Turkey. All of these countries are vital to the US strategy to counterbalance Russian influence from the Baltic to the Black Sea. In addition to pushing forward proposals for pipeline interconnectors, liquefied natural gas facilities and nuclear power options to boost Europe’s energy diversification away from Russia, Nuland is discussing security proposals to underscore the US security commitment to Central and Eastern Europe. Poland and Lithuania are pushing for a more permanent and visible NATO presence in the Baltic region, and there are hints that Romania is requesting a larger and more regular presence in the Black Sea. Russia is already reeling from low oil prices and painful budget cuts, even for the defence sector, but Moscow would not take a larger NATO encroachment on these two fronts lightly. And so we circle back to Turkey. Turkey is both a NATO member and the gatekeeper to the Black Sea. The Montreux Convention limits the size, number and duration of stay of naval vessels in the Black Sea, placing a bar on any naval buildup. Even so, Turkey’s vote in NATO would be necessary to increase the size and frequency of naval rotations in the Black Sea within the limits of the convention. At the end of this week, Nuland will join US Vice President Joe Biden in Turkey and hold high-level talks with Turkish leaders. The United States could use this opportunity to try to bring Ankara back into dialogue with Russia over Syria. It could also use the occasion to feel out Turkey’s position on NATO’s role in Black Sea security. If Moscow feels its hostile relationship with Turkey has pushed Ankara too far toward its NATO allies, Russia could resume a dialogue with Turkey, making a compromise in Syria possible. A lot of pieces are in play this week, and many of them take us back to the question of whether Moscow and Ankara could be ready to re-engage. Strafor should look at the what-hasn’t-worked summary statement, it’s simple: everything. American presidents have been stuck on the notion for at least a decade or more that the US is the mightiest military power in the world. This might seem strange when talking about a military that, since its last significant victory in World War II, hasn’t won much of anything against any force that offered it serious opposition, no matter how lightly armed or informally trained. It’s a military that, since 9/11, has proven incapable of effectively building allied armies in the Greater Middle East and has stumbled from one disaster to another in the region. Time to remind Stratford that Washington’s war on terror strategy has already sent at least $1.6 trillion down the drain, left thousands of American troops and hundreds of thousands, if not millions, of Muslims dead. Along the way we lost precious freedoms to the ever expanding national security state. While at home we lost 400,000 Americans to gun violence vs 4,000 to terrorist attacks. Seems to me we have our priorities grossly misplaced if protecting American lives is the goal of government. If the Ukrainian Verkhovna Rada continues to deny the separatists an opportunity to achieve their objectives, the Minsk II protocol is headed towards failure. In that event, the conflict will inevitably be even more difficult to contain than it already is. It is imperative that western leaders focus not on demanding the implementation of Minsk II, but rather on using its framework to complete further negotiations. Insisting that either side subscribe to the current protocol is tantamount to asking for a unilateral surrender.